Nokia this week announced the new In-Location Alliance that will be working on the innovation and promotion of a new standard-based short-range wireless technology, that will make it possible to locate objects or positions indoors with extremely high accuracy, using mobile devices. The In-Location Alliance includes more than 20 tech companies across different industries, with Nokia being one of the founding members. Nokia, wanting to become the “Where platform”, already have quite a few positioning services in the works, and have talked about Indoor position for a while. To speed up the adaptation, and with hopes to create a unified standard, Nokia now seek a cooperation with other high profile name from the mobile industry such as Broadcom, CSR, Qualcomm, Samsung Electronics, and Sony Mobile Communications. Neither Apple or Google is however part of this new Alliance. Nokia has up till now mainly focused on and promoted their High Accuracy Indoor Positioning (HAIP) Solution. This technology uses a modified, new generation and low energy feature of the Bluetooth® 4.0 specification, and allows for an accuracy of one meter. With additional changes to the technology Nokia says it will be possible to improve the accuracy down to 20cm. With improved accuracy, not only can the indoor positioning help you find the store in the mall that has that cheap deal on jeans this week, but it can also be used in large warehouses to keep track of stock, and locate inventory. 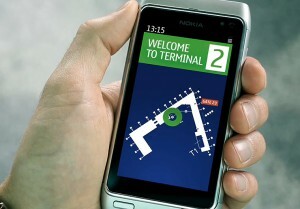 If the new In-Location Alliance bears the fruit that both Nokia and their new partners hope, in the near future it might be possible for both regular consumers and large corporations to locate objects or positions indoors with extremely high accuracy using a mobile device, you may already have in your pocket. The possibilities and the adaptations of this new positioning technology can potentially be endless. The In-Location Alliance members will be piloting the most promising services, and consider and evaluate the services based on cost for adaptation and equipment installation factors, compared to the benefit of the solution and services it may bring. They also aim to promote open interfaces and a standards-based approach, thus ensuring that a multi-vendor environment is possible, benefiting all involved, and in the end also the end consumer. Similar to technologies like GSM, Bluetooth, and NFC, that started as various research projects in a number of companies, but eventually became worldwide standards thanks to industry collaboration, HAIP is likely to be adopted in the same way. The initial technology is expected to be based on enhanced Bluetooth 4.0 low-energy technology and WiFi. Pre-commercial trials will begin in 2012, with the first mobile handset based implementations expected to arrive in consumer hands in 2013. HAIP is based on existing technology and is not expected to add significantly to handset prices, but it does require the installation of in-building equipment. Founding members include of the In-Location Alliance include: Broadcom, CSR, Dialog Semiconductor, Eptisa, Geomobile, Genasys, Indra, Insiteo, Nokia, Nomadic Solutions, Nordic Semiconductor, Nordic Technology Group, NowOn, Primax Electronics, Qualcomm, RapidBlue Solutions, Samsung Electronics, Seolane Innovation, Sony Mobile Communications, TamperSeal AB, Team Action Zone and Visioglobe. Previous Previous post: Samsung GALAXY Note 10.1 has arrived in the U.S.